Wake by Laura Madeline Wiseman transforms the grim reaper into a female, a cart driver with a passenger, and a character of intrigue. She is both a gentle friend and an aggressive enemy; she is a migrant of souls. Fairy tale and mythology is a mere starting point to Wiseman’s Death — for Wiseman is far more interested in the tensions of the feminine/feminist and the sensual/sexual. Death is a symbol of Society, not the end of Individual. were who we turned to, a pale fiery gaze of promise. Take the gulp, she said and, you’ll have your man. A bold and daring project, Wiseman as usual delivers, taking her readers on a journey that is both familiar in theme and focus, yet challenging and intellectual in its retelling. 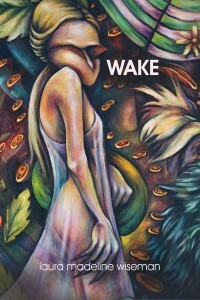 Wake is 67 pp and published by Aldrich Press. 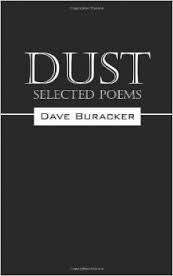 Dust by Dave Buracker is a chapbook of poems that are simple, accessible, and informal, yet written with such a punch in the music of language, they are wonderful to hear as each poem is read. Buracker’s style may need a little getting used to: the language is not beautiful, magical, or particularly lyrical, but don’t be fooled. These poems utilize conventions such as alliteration and sound repetition that are highlighted within the backdrop of short lines that help draw attention to the the beauty of their music. Buracker must listen to his word choices with a great deal of attention and discretion; it is not surprising to learn that he is also a musician. Be careful readers, if you only like reading things once: this thin collection might just leave you with a desire to open the book several times over. Dust is 43 pp and can be ordered from Amazon as well as other online outlets. 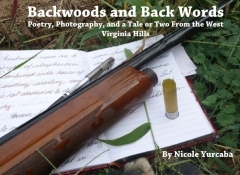 Backwoods and Back Words by Nicole Yurcaba is a unique collection of words that is fresh, inspiring and heartwarming. Yurcaba intertwines poetry, photography, and slices of memoir into a vision that is fun to read because the reader doesn’t know what the next piece will be like. Yurcaba comes from a Ukrainian background, and although that is apparent in her writing, in this collection she focuses more on the experiences of her rural Pennsylvania and West Virginia growth into adulthood. With so many new books of poetry to read each year, the life of a strong Ukrainian woman who hunts and fishes, keeps cattle and visits coal mines is a wonderful change of pace in the world of contemporary American poetry. Poems such as “My Hands”, “Dress Rehearsal” and “Dirt Between the Fingernails” are excellent reminders of gender stereotypes, where a woman shouldn’t have to prove anything to anyone, but just by living life, demonstrates her strength of character, demanding respect in the process. Yurcaba has several memoir pieces in the collection, my favorite being “Fossilized”, a story of a young girl’s initial romantic view of the coal mine, and then her understanding of the horrible circumstances a coal mine brings to both workers and caged birds alike. Poems such as “Hunting Days” are met with other poems such as “Night Vigil”, a poem about the beauty of owls, and one can see that Yurcaba is a lover of the all things outdoors. She is reminding us Big City dwellers, where we are lucky to find a patch of grass for our dog, that being out in nature with animals is a lifestyle, that to own a rifle isn’t a bad thing. Yurcaba’s next collection of poetry will be more about her Ukrainian heritage, and after reading Backwoods and Back Words, I can’t wait for its release. Backwoods and Back Words is published by Unbound Content and is 79 pp. It can be ordered from the publisher, Amazon and other channels.